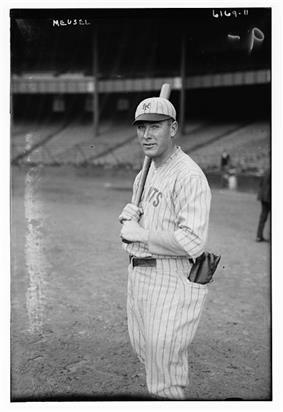 Emil Frederick "Irish" Meusel (June 9, 1893 – March 1, 1963) was an American baseball Left fielder. He was first signed with the Washington Senators in 1914 and played one game. After a tour in the minor league, he was traded to the Philadelphia Phillies in 1918. He played four years for the Phillies, averaging over .300 in three of those years. Midway through the 1921 season, he was traded to the New York Giants. His subsequent play helped the Giants erase a 7½-game deficit to edge out the Pittsburgh Pirates and claim the pennant. The Giants went on to win the 1921 World Series over the New York Yankees. His brother, Bob Meusel, played for the Yankees. He appeared in four consecutive World Series for the Giants: 1921, 1922, 1923, and 1924. His final year was with the Brooklyn Dodgers in 1927. In 1923, playing for the Giants, he led the National League with 125 RBIs. His career average is .310 with 819 RBIs. He died on March 1, 1963.